Brew Ventures is founded by devoted home winemakers who found a gap in technology options for supporting the winemaking process. The winemaking process has distinct steps that challenge hobbyists to take measures, make calculations, and then check back in a specific amount of time. 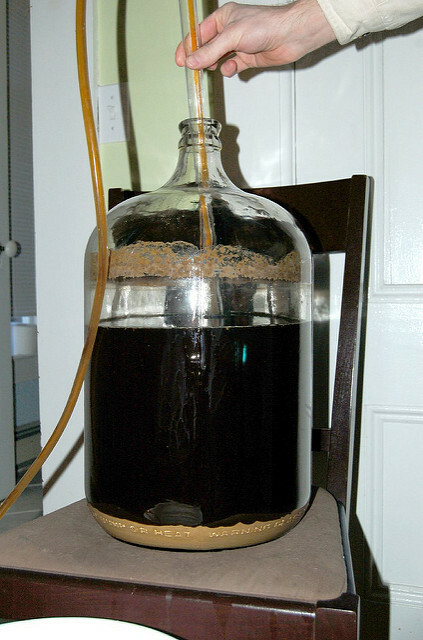 The vision of Brew Ventures relates to supporting the winemaking process, share the process and wine with family and friends, educate hobbyists, and allow easy re-ordering of winemaking materials. In this first phase the focus is on having an easy-to-use app for supporting winemaking all the way through to creation of a tasting notes notebook, and learning about this target audience. Because Phase 1 of the Enofile app is focused on supporting the steps of winemaking, the initial research is focused on the usability of the app. I used the think aloud method to encourage users to explain their thought process as they interact with the app. We will collect data about success rates as well as quantitative data about using the app. Usability testing typically uses a task-based approach to uncover where users may have difficulty completing a task. It’s a qualitative method that seeks to identify issues and determine why a user is having the issue. The industry standard shows that 5 users will discover about 85% of issues in product through this method. Additionally, Brew Ventures would like to gather data about the habits of the target audience to inform the next versions of the app and the business model. Learn about current habits related to supporting wine making, purchasing materials, etc. Participants were able to easily complete the major tasks of starting a batch, adding a reminder, completing a batch, and creating a tasting sheet. The most challenging part of the app is organizing the winemaking steps into orderly, useful steps. Currently, the app doesn’t offer templates for this; prototype tested had pre-populated steps for ease of testing. Discussion with participants showed diversity in how they conceive the winemaking process. Templates and help text should be developed to support users in creating steps. Research report provided five usability improvements, and five enhancements. This was a hybrid usability and interview research project with participants sharing habits and thoughts, as well as doing tasks. Throughout the session, participants expressed genuine interest and enthusiasm for using the app. Participants expressed that using such an app for tracking would be “useful” or “very useful” to their processes: four said “very useful” for my winemaking; two said “useful for my winemaking. This confirms the app solves a real problem and provides value that a spreadsheet or notebook cannot. As noted, the app was thought to be easy to use. Of the 5 people who assessed its “usefulness for how I make wine”, four rated the app “very useful” or “useful” to their process. Interestingly, all but one participant said they would still keep a paper notebook or parallel notes on paper. Although some of the desire for paper comes from the older demographic of participants, data on paper has some advantages for later browsing and reflecting. 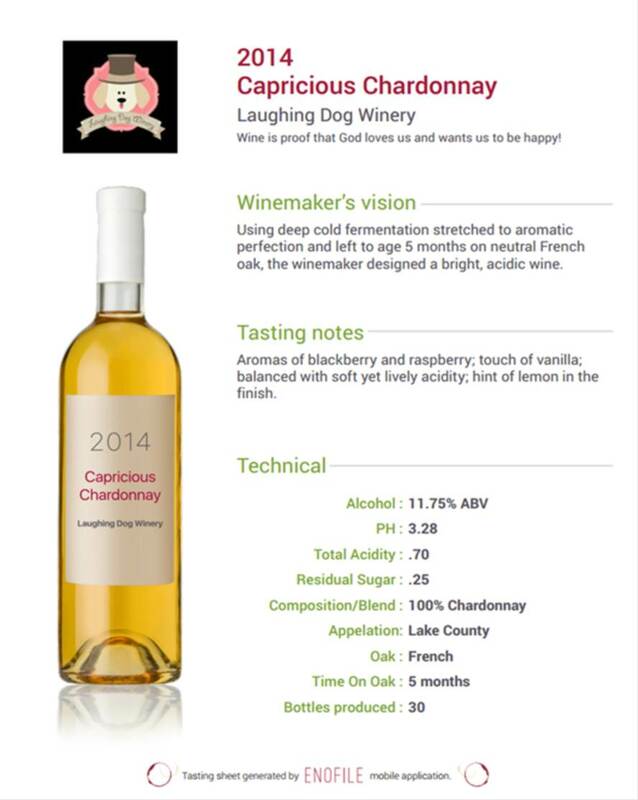 Tasting Notes allow a user to taste a wine and analytically describe its characteristics. Participants were pleased with how Tasting Notes can help them verbalize what they taste: “this would help me get better at identifying wine taste.” (P2) Four of the six winemakers said they were weak in this area, even though they were accomplished at making wine. Another noted his opinion that winemakers as a group were not adept at tasting wine. Confirm the impression that winemakers aren’t comfortable with tasting and describing wine through more research. There may be a great opportunity to support this group in becoming more adept. Seek to highlight this part of the app even more in marketing. 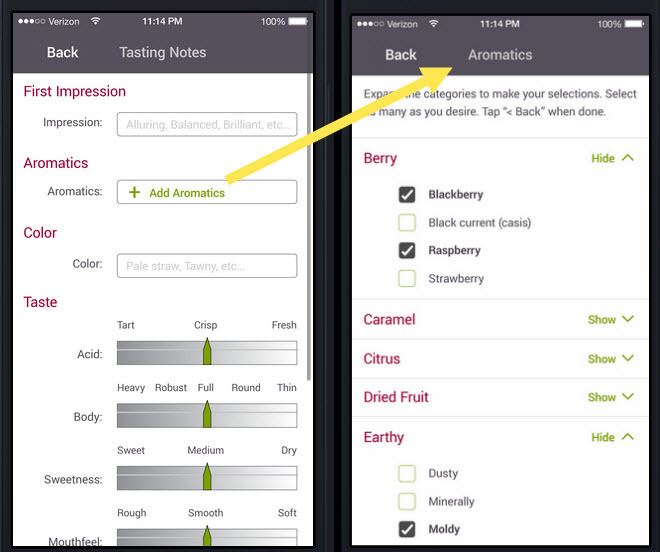 The Tasting Note and Tasting Sheet are a unique “value add” that goes beyond the app’s ability to help with notetaking and process support.